This topic may become a series, as I have much to say on the subject. Look for future posts, and if you see this title again–“Missing Pieces of Modern Eskrima Practice”–you may notice that I’ll have added part II, part III, etc., to the end of the title. I fancy myself an “Old School” Eskrimador, despite that I have yet to reach my 50s. However, my teachers were old men and they taught the old styles. I was in a small circle until I had reached adulthood, and by the time I was old enough to issue challenges and think for myself–the FMA community around me had already grounded itself in this video and seminar culture. Most of you who strongly disagree with my views, do so because you are part of the new guard. Perhaps your teachers are older, but if they did not come up in the outdated method I did–or they were part of the new FMA world order–you won’t like what I say, nor will you like the bluntness in which I deliver it. 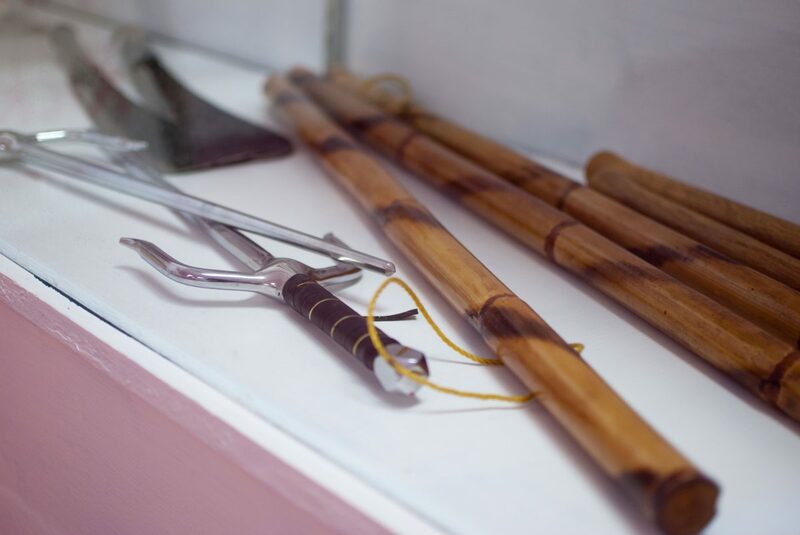 The new-school method of teaching and ranking in the art has left Modern Eskrima with many holes. One of those shortcomings is the lack of Power Mechanics. Ask a modern Eskrimador what he knows of power mechanics, and he will attempt to overexplain what I define as “hitting harder”. “Hitting Harder” is not “Power Mechanics”. I’ve listened to even some grandmasters try to explain this concept, instead of making things easier by saying their style does not address it. It’s sad, and it’s become somewhat of a game for me to watch well-known teachers with great reputations fumble over this simple concept that very few have bothered to explore. Most martial artists can barely define power mechanics; and Lord help them if they are asked to demonstrate it… or teach it! Not having power mechanics in your system is one thing. But to not have it, and then pretend to have it is most shameful of all. To do so demonstrates what is wrong with the state of FMAs today: Filipino Martial Artists try to hard to claim mastery and/or knowledge of everything, and as a result they are proficient at almost nothing. The method that most FMA teachers choose to study and teach the art is the reason for these missing links. Studying in seminars a few times a year, studying by DVD and online courses, studying with men who are not true experts in the art, studying with the prospect of teaching much too soon, achieving rank without challenging or being challenged, achieving rank without engaging in many contests, sharing information with other teachers, gathering information from other teachers, learning skills superficially without much in-depth dissection–are all reasons why these missing links exist. Many aspects of the art must be repeated over and over; they must be trained and practiced in a way the modern martial artist calls “mindlessly”–which is not such a bad thing. Techniques and skills must be trained until they are automatic responses, and the fighter uses them without thought. It is then that these skills can be said to be understood well enough to unlock their rarely-explored nuances and details. Among these things is the idea I call “power mechanics”. Power Mechanics is the study of generating maximum power with techniques without sacrificing function, speed, balance, effectiveness, or efficiency. This is why I say that one needs to do more than simply “hit harder”. To both the naked eye as well as the inexperienced martial artist (and yes, even a “Master” can be inexperienced), power mechanics involves simply hitting harder, and perhaps a wind-up. However, after ample practice and reflection, the physics of a technique will change in order to gain maximum destructability while sacrificing little else. The power mechanics of one technique is not equal to that of another. A downward “caveman” blow will require a different type of power generation than a backhand strike–and both a downward strike and backhand strike will require a different type of power generation than an abaniko strike. The power mechanics will change from one weapon to another as well. You cannot use a downward blow with a machete the same way you would generate power with a rattan stick, and both will be enormously different than the same strike done with an icepick, a hammer fist, and a walking cane. Power mechanics also changes with the target. Striking the crown of the opponent is very different than trying to break his nose with the same weapon and same angled strike. Striking the crown will be different than striking the opponent’s collarbone. Striking the crown is different than striking his wrist. And if your opponent is holding a weapon, you will attack his weapon hand differently than you will when attacking his free hand. If the opponent is aggressive and attacking frequently, it will affect your power mechanics as well–since you must learn to use power differently as an initiator of the exchange than if you were counterattacking. Each angle of your system must take all those details into account when studying those angles, and how do develop power. There is power in attacking, power in striking defensively, power while standing in place, power when striking in combination, power on a faster opponent, power on a stronger opponent, and power when you are simply trying to stop an opponent versus power when you want to kill him. Like I said, this is much more than “hitting harder”, and it darn sure can’t be taught in a seminar or book. You can’t even teach it over the course of a weekend. What footwork must be utilized to change from a regular #1 strike to a power #1 strike? Will there be modifications to your body movement? Head movement? What are the disadvantages to using the #1 with full power? Trust me, there are plenty. I’m leading you. What position must your opponent be placed in to make him vulnerable to your #1 power strike? Here’s a hint: You shouldn’t attack your opponent with a power strike if he is comfortable in his normal fighting stance. This is the position most Eskrimadors have trained their blocks in, so he is most likely to be successful in stopping your power #1 strike. In other words, you must find ways to set your opponent up to disrupt his stance and ability to defend your power #1 strike. How much time does it take to deliver the power #1 strike, and once you use it, what position will you most likely be in? You need this information ^^ to detemine this —> What is the best follow up to my power #1 strike? How should I best use the power #1 if the opponent is attacking? In other words, using the #1 strike while rooted vs using the power #1 while moving backward/evading vs using the power #1 while moving forward. This is one of the least studied aspects of Eskrima. Everyone assumes that Eskrima can be practiced while flatfooted, and any old time master can blow that theory out the water with one match. There is a difference between practiced Eskrima and utilized Eskrima, and there isn’t supposed to be. Once you have developed #1’s theories 1-9, then do the same with power #1 with various weapons and to various targets about the opponent. Some will be universal, but many will not. Take for example, my #1 strike, which is the out to in strike to the temple. A #1 to the hand is quite different if I am striking the weapon hand or the opponent’s rear hand. The footwork is different, and the danger is different. The opponent’s weapon is different as well. If my opponent has a stick, I will attack his rear hand versus if he is holding a knife (if he is holding a knife in the front hand, we do not attack the rear/naked hand. Only if he is holding the knife in the rear hand). There is so much to explore and explain, I’ll close here. Hopefully, you will have a lot to keep you busy for the next year 🙂 Remember, don’t rush through this lessons. Most teachers have skipped them altogether. If you’d like to take your Eskrima to a higher level, you need this very important and neglected knowledge! EDIT: One last thing… the same can be done with your empty hands techniques. If you like this article, you’ll love our other articles, as well as our books. Please subscribe to this blog, visit our books page, and tell you friends about us! The insight gleaned is very thought provoking. Leaves me feeling frustrated that i only came to the knowledge of FMA so late in my life (instead of younger). And even more so,that the ability to accquire the skills you speak of, requires a dedication and discipline that few can readily commit to. Save by,comitting to full-time study,as in your 2 year FMA apprenticeship course. Again,due to the onslaught of ‘time’ (for it waits for no one). Its like being shown a burger,when one is real hungry. Inspite of these personal frustrations,i am grateful for being enlightened through your article.To a path for improvement. For this, i am appreciative. Thank you Garrith. And I have good news, I am building a school back home this year! I will hire a company to build and once that is done, around the beginning of 2017, we will begin classes. Soon as we start the construction I was going to post and article and pictures on the blog! Master Gadula,that is awesome news! Asking that you keep me on your list of sincerely interested potential candidates,please. I say potential as i know your standards are stringent. I feel that you can better mould one who is genuinely interested in the path he has chosen. I desire to be proficient in FMA through dedicated daily practice,more than i desire anything in my life. Im sure you will test this claim. Yet,i felt it important to share with you. Thank you, and I appreciate your passion for the arts! I think you will do great!